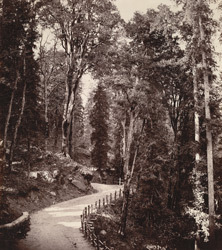 Photograph of a forest road, Murree, now in Pakistan, taken by Baker and Burke in 1865, from the Macnabb collection. Murree is situated in the foothills of the Himalayas north-east of Islamabad in Pakistan. It was the summer residence of the local Government in the Punjab until 1876. There was a large military cantonment nearby, on the Grand Trunk road at Rawalpindi. The hill-station at Murree was established in 1851; it was the second largest hill-station in the area after the summer Presidency Capital at Simla. Murree was the site of one of four Lawrence Asylums set up by Lieutenant Colonel Sir Henry Montgomery Lawrence and Reverend William Parker to provide for the children of Officers and other serving soldiers, and is still in use as a private school today.